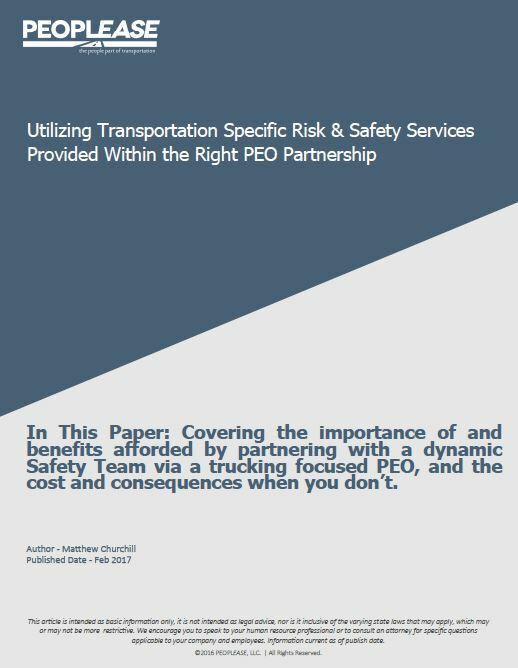 In This Paper: Covering the importance of and benefits afforded by partnering with a dynamic Safety Team via a trucking focused PEO, and the cost and consequences when you don’t. In the ever changing transportation industry, rules and regulations regarding risk and safety compliance can be very challenging to stay on top or ahead of. On average, we work with low margins in the transportation industry which makes keeping up with perpetually evolving mandates— not to mention staffing a complete and qualified risk and safety management department— a real challenge for transportation companies of all sizes. Improved DOT Rating and CSA Scores When Try Us Trucking (TUT) initially entered a PEO partnership with PEOPLEASE, they had a conditional DOT rating and CSA scores above threshold in all areas. Our PEO’s Safety Manager first conducted a mock DOT audit to independently assess the company’s status before reviewing the DOT’s actual findings for comparison. This process allowed for scrupulous analyzation and precise pin pointing of each factor that had previously driven the scores over the CSA threshold. We then outlined the collective findings and advised the client on what corrective actions and changes in policy and procedure could be taken in an effort to fix the discrepancies, improve scores, and help to reduce risk and citations. The next step was to have the client request a forced audit from the DOT in order to show all of the safety management improvements that had been put into place. Another audit then took place to verify that safety management practices, policies and procedures had been augmented at TUT. The DOT was satisfied with the findings in this audit, and as a result changed TUT’s rating and promoted their status. Following our team’s intervention, Try Us Trucking was able to pass through the scales more efficiently, lower their auto liability coverage rates, and haul freight they had previously been excluded from hauling. Most importantly, this carrier is now a safe and compliant one. Big Rig Trucking (BRT) had a surprise OSHA inspection on their shop and yard that led to a multitude of violations and subsequent fines. Fortunately, BRT had signed on with PEOPLEASE only days before, and immediately reached out to inform their new Safety Manager about the inspection results. The PEO safety manager came in and conducted a mock OSHA inspection, reviewing all of the noted violations BRT was given by OSHA. The carrier was not only advised on how to correct all of the noted violations, but also encouraged to petition OSHA to reevaluate the fines. OSHA revisited the case, and taking into consideration that a qualified Safety Team had just been acquired by BRT and was already in action to make improvements, the fines were significantly reduced, ultimately recovering thousands of dollars. Increased Staff Training and Knowledge. Decreased number of Workers’ Compensation Claims. Trucking company Haul The Way had a high MOD rating, several substantial workers’ compensation claims in their history, and year after year was repeatedly incurring the same type of comp claims. Our PEO safety manager was brought in to conduct a full audit of the claims and identify the root causation. The audit revealed that the firm’s drivers had received no formal training on how to safely and properly secure freight and perform their daily job tasks. A thorough worksite job function analysis was then completed, and a plan was immediately devised to educate workers by providing them with the necessary tools and knowledge needed to safely and effectively perform job duties. The implementation of adequate safety training addressed the claim causation right at the source, and ultimately reduced the amount of claims Haul The Way was amassing. The best solution to overcome the daunting task of staying ahead of risk and safety compliance is working in partnership with a PEO that provides a 24/7, transportation specific risk and safety advisor. The benefits of having a face-to-face risk and safety advisor working with your company are numerous and unparalleled. With a PEO like PEOPLEASE, you not only receive transportation specific advice and recommendations from experts, but you also benefit from a customized program geared towards YOUR company’s overall operations. When choosing to partner with the right PEO— whether it be for the first time, or if you’ve done so previously— selecting one that offers risk and safety services is paramount and can benefit the entire operation. At PEOPLEASE, we pride ourselves on expertly navigating our partners down the risky road. With our expert advice and guidance, your company can elevate safety standards and reduce risks while simultaneously adding to your organization’s bottom line. Contact us today to find out how a partnership with PEOPLEASE can help drive success for your trucking company!